Fickle Feline: autism in the emergency room. Monday morning: 10am. My cell phone rings. Call display = Max's school = oh f*ck. It's the principal, who reports that Max has fallen and has hurt his arm. I need to come pick him up and take him to the hospital. Not exactly a good start to the week. When I arrived at the school, I found Max in the arms of his EA, his left arm hanging limp. Just the action of having him stand up made him moan in agony. Apparently he had thrown himself on the floor during an episode of non-compliance (a fairly typical behaviour for him). Max's teacher and principal helped me out to the car with Max. He turned white as a sheet as I strapped him into the car and my heart broke a bit. I had booked an appointment with our family doctor, but it was clear that Max would need an x-ray, so off to the Oakville Trafalgar Memorial ER we went. Our most recent health care experience at our local drop-in clinic had me dreading the inevitable looks of judgement we would receive from people in the waiting room as well as the impatience and general ignorance of the nurses and doctors who would be treating Max. As common as Autism is, and the higher rate of injury these kids experience in comparison to their neurotypical peers, you'd think medical staff would know how to deal with children on the spectrum, at least a little. The ER was packed and as I waited to check Max in, he looked around in bewilderment and clung to my leg with his good arm. 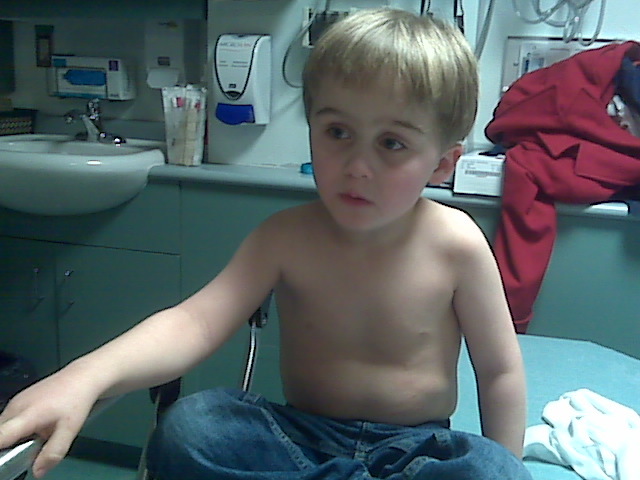 I explained to the triage nurse that Max had hurt his arm, and that he is Autistic. She asked me to come around to the other side so she could do an assessment. When we sat down, she crouched down to Max's level and introduced herself to him as "Darcy" and very gently asked him where it hurt. He whimpered "elbow" as she felt his fingers, hand, and wrist. He winced in pain and she looked very concerned. She said "I hate to see him in so much pain!". Amazing. I was blown away by her compassion and humanity. I was relieved that she saw Max as just a little guy in tremendous pain and didn't think that because he had Autism he had two heads. We went and sat in the waiting area and within 5 minutes Max's name was called. 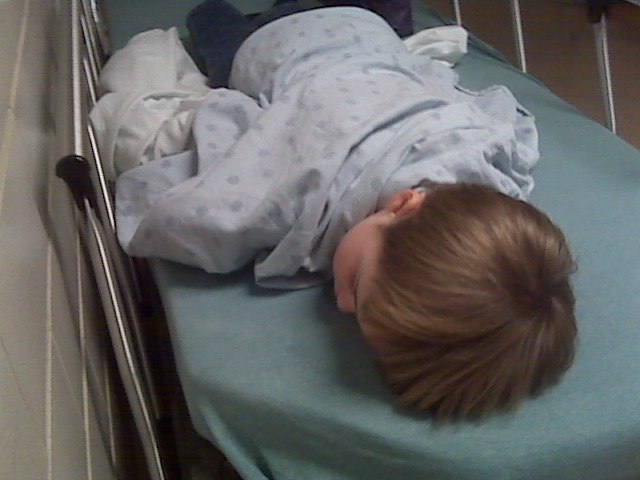 While we waited for the doctor, the nurses made sure Max was as comfortable as possible. It took about an hour for a doctor to come and assess Max, but it was much nicer to be waiting where Max could be comfortable instead of the crowded waiting room. 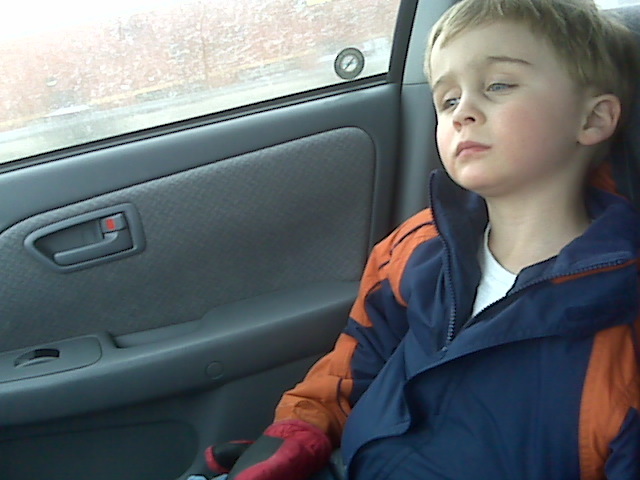 When the doctor arrived I gave him the run down of what happened and told him that it would be hard for Max to tell him exactly what hurt because he is Autistic. Again, the doctor (Dr. Knott) was very kind. He told me he thought Max had dislocated his elbow, but because of the communication issue, wanted to do an x-ray to make sure that was what we were dealing with. The x-ray technician, Tey, was gentle with Max and had me stay with him while she got x-rays of all the angles she needed. At some point in the process, she actually popped Max's elbow back into place (a very common occurrence with elbow dislocations). The doctor confirmed that Max's elbow had in fact been dislocated and told us he should be fine now. Given that Max was trying to use the gurney as a jungle gym, I agreed with his diagnosis. I cannot say enough how impressed I am with the nurses and doctors at the Oakville Trafalgar ER. They treated Max with compassion and humanity and made what could have been a terrible experience into a manageable one. He was treated kindly and respectfully at all times and the fact that he has Autism was never an issue. I appreciated that accommodations were made for him, without me even having to ask. As often as I write about the Canadian health care system failing Max, I think it is important to recognize instances where individuals knock it out of the park and go above and beyond. Oakville Trafalgar Memorial ER for the win. We have had two elbow dislocations - both with me, both on the side of the road, when Khaled was around 2 and then when he was 3. It is when you hold on to their arm, they pull to run in to the road, or some direction that is obviously dangerous and you dont let go. Hence elbow gets pulled. Its very painful to move that arm. Its easy to fix. Did you find out what exactly went down at the school? I didn't get the straight goods, no. I am guessing something like you described happened.